On the 17th of May 2017, SANEC had the esteem privilege to host the Mozambican delegation, which consisted of 55 companies. Entrepreneurs and businesses from the Center for Investment Promotions in Mozambique, who were accompanied by their Director General, Mr. Lourenco Sambo; The Deputy Prime Minister, H.E Mr. Ragendra De Sousa, acclimated and defined the current trade and investment opportunities in their country, as well as outlined the progress growth of the economy and the positive aspects of the business environment thus far. Our long time partner and stakeholder, the Embassy of The Republic of Mozambique in Brussels, Economic Attaché, Mrs. Maria Albertina Gomes Da Silva, was also present and accompanied the delegation to the Netherlands. 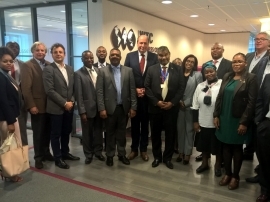 All of the individuals were present to solidify trade relations and partnership opportunities with SANEC and the Dutch Business network, specialized in the sectors beneficial for both parties. SANEC in the past (about 4 years ago), with our offices in Johannesburg and the Hague, had organized an Economic and Trade Mission to Mozambique, consisting of various Dutch businesses in various sectors who wanted to grasp at the opportunities present in the country as well as find local partners to execute their goals and objectives hand in hand. SANEC and its members deemed this Mission at success, which led to various projects being birthed from this encounter, which includes, the Port and Corridor program that we (still till this day) have running, with the MCLI (Maputo Corridor Logistics Initiative) who have their office base in Johannesburg, South Africa. The seminar provided a great opportunity for our SANEC (new and current) members, to also present their products and services to the delegation, who seemed eager and impressed to follow through on building contacts for future ventures. Our SANEC Chairman and Chairman of NAFTC-AFRICA, Mr. Jan Hak also provided all present on the day with a presentation on Agro-processing opportunities that his organization is currently running in Sub-Saharan Africa and in other parts of the world. SANEC would like to thank all that participated and took time out of their day to support this event, as well as meet with all the Mozambican companies and delegates that were present on the day. We look forward to working together with the CPI (Center for Investment Promotion) in Mozambique to organize another Mozambican Mission which will include a authentic and tangible match-making session to benefit Mozambican businesses and their Dutch counterparts in the near future. Please have a look at our Facebook page for a photo impressions and for the presentations that were delivered on the day. Looking forward to having you present at our next events!